Find a Historical trip that explores Spain. There are 64 tours to choose from, that range in length from 3 days up to 22 days. The most popular month for these tours is September, which has the most tour departures. "Our tour guide, Carlos Sanchez, took our trip to the next level. 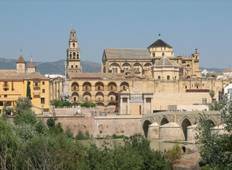 He knew every popular..."
"The tour was really interesting, an easy way to discover Andalusia. Granada is awesome..."
"it was a good tour. The vegetarian options were very average. Need to atrer to vegetarians..."
"The team was really good with all the questions. Guide and Hotels good ¡¡ Value..."
"It was a quick paced tour, but it touched most of the city highlights of each stop...."